Just because the mercury has dropped doesn’t mean going out has to go on ice — or does it? Whether it’s igloos, ski chalet inspo, or massive fire pits that make for cool outdoor fun (with toasty drinks and blankets) there’s a flurry of wintertime al fresco dining opportunities this season. Not near any of these restaurants? Find a spot near you on OpenTable.com. It’s a two-fer experience at the Watergate, where the 12-foot-tall igloos on The Next Whisky Bar terrace bring on the heat in more ways than one. With enough room for up to eight, different experiences include igloo bites like crab fritters and spicy meatballs; a three-course dessert menu; a tea menu; fondue; and spicy whisky flights. Top of the Skate on Top of the Gate also becomes a magical winter wonderland, with the rooftop bar being transformed into a skating rink and winter lounge with hot mulled wine, pretzels, cider donuts, and more frosty — and frosted! — treats. 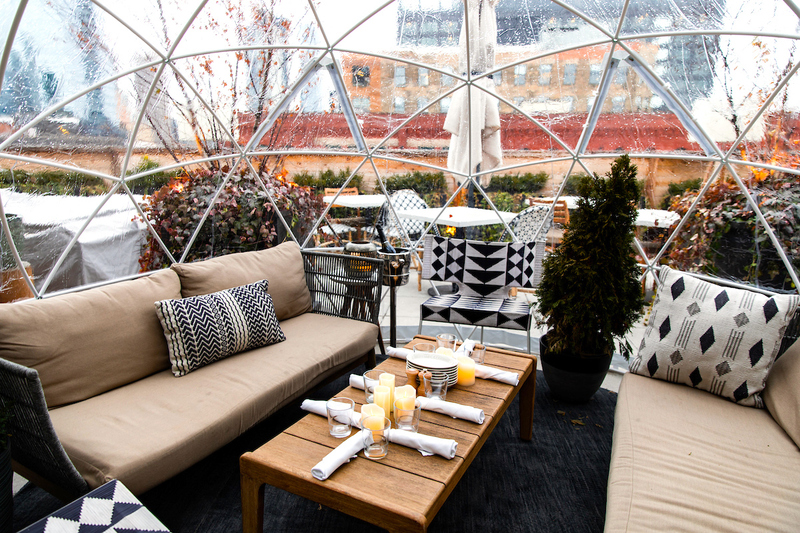 Make a reservation at Kingbird Igloos. 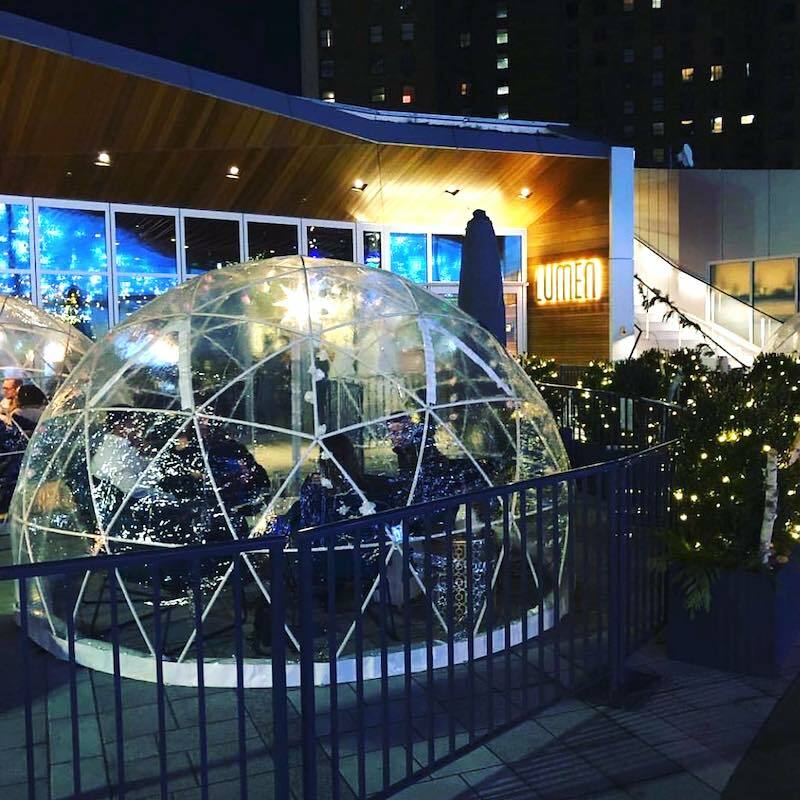 Brand-new patio igloos mean those in the Windy City can enjoy the patio at Aba all year long. 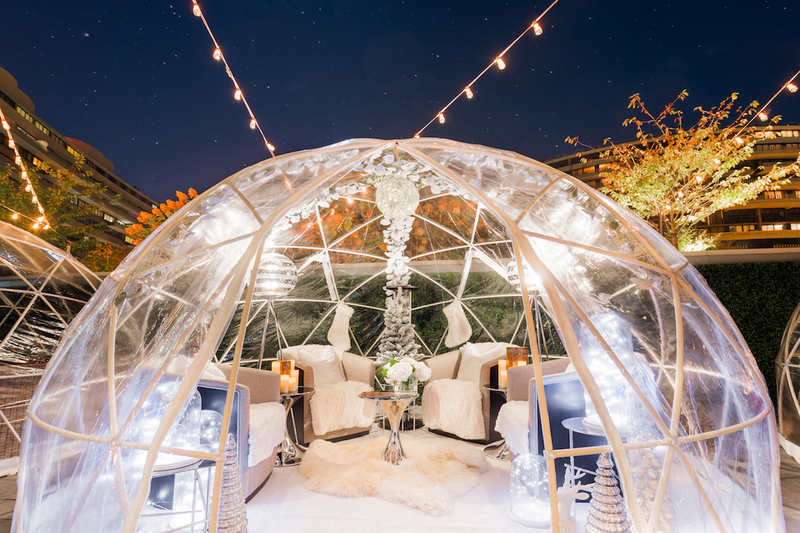 Two igloos seat up to six guests at a communal dining table, and two other igloos can seat up to eight lounge-style. The frosty air is a vibrant juxtaposition from the menu, where Mediterranean-inspired plates feature a lighter style of protein-packed plates, and wines hailing from the same region. Make a reservation at Aba. 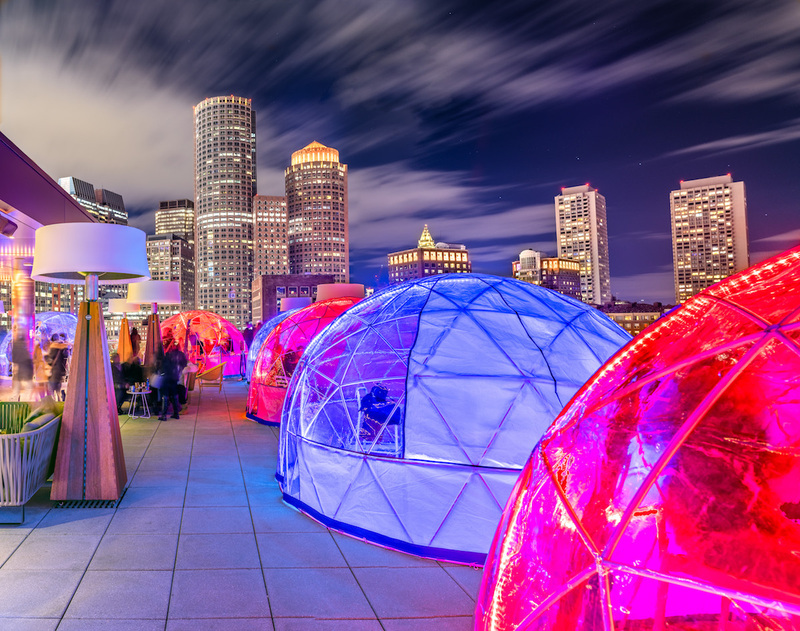 It already has one of the best views of the Boston skyline in the summer, but with their popular rooftop igloos, the Envoy Hotel has quite assuredly one of the coolest panoramas year-round — both for those inside and those driving by alike. It’s even more fun to grab a drink than normal, too, in the winter, because when those inside press a button for one of master mixologist Brain McDougall’s creative cocktails, the domes light up in neon pastel colors for all to admire. After a couple of hours snuggled in fleece blankets, the party transitions indoors to Outlook Kitchen & Bar for some menu favorites like steamy French onion soup and hearty black garlic carbonara with pancetta. Make a reservation at Igloos @ Lookout Rooftop Bar. 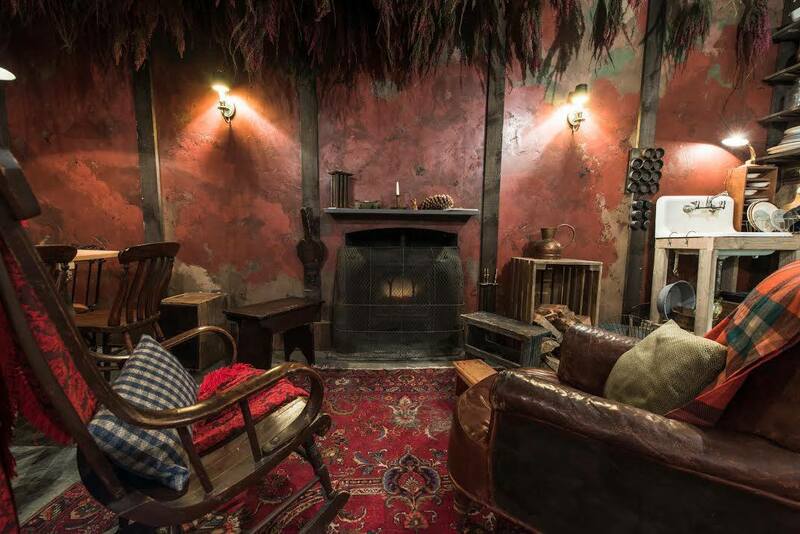 There’s no need to trek to the country to escape the hustle and bustle of the Big Apple with The Lodge at Gallow Green, the McKittrick Hotel’s annual transformation of its roof into a cozy cabin with outdoor fire pits, blankets, and comfort food like cheese plates, meatballs, and an ooey-gooey Nutella calzone. There are “sleeping bunks” and fireplaces to chill out by in the chalet-inspired lounge, replete with real pine trees. Make a reservation at The Lodge at Gallow Green. 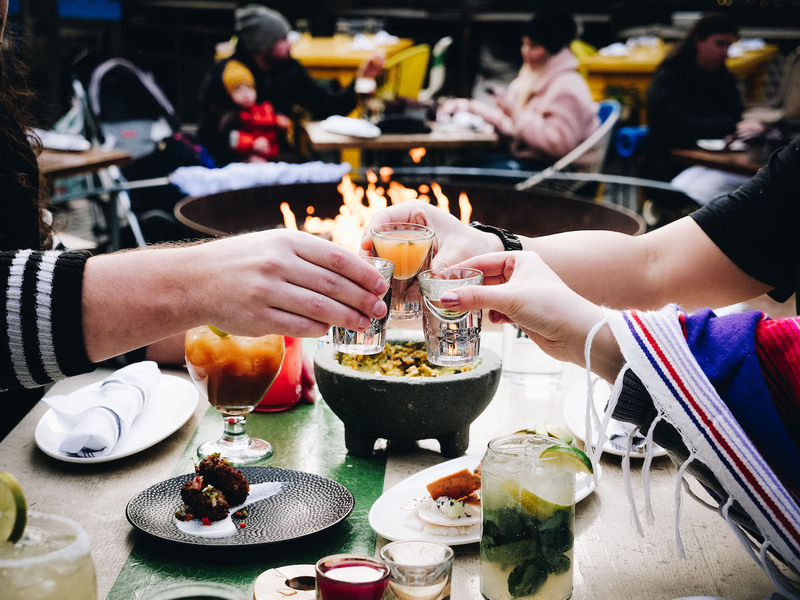 Mexico comes to Toronto’s cool Distillery District in the form of crackling fire pits and panchos. The patio can be heated year-round in this Canadian hot spot, but come winter, it gets even cozier rubbing elbows — especially with the share-style menu and one of the country’s largest tequila and mezcal menus. Make a reservation at El Catrin. This Beacon Park haunt is renowned for its expansive wraparound patio that also extends to the roof, and now despite wintry Michigan climes, it’s a win-win situation thanks to heated igloos. Communal seating for six to eight people has a full menu available — including favorites like the farmer’s market bowl, filled with hummus, tabbouleh, vegetables, olives, and bread. There are also the turkey club and the croque monsieur, both of which come on a pretzel roll, perfect for pairing with Lumen’s extensive beer menu. Make a reservation at Lumen. What unique wintertime al fresco dining experiences have you been enjoying? Let us know here or over on Facebook, Instagram, Pinterest, or Twitter. And, remember to snap + share your #dishpics with us on Instagram for a chance to win in our weekly giveaway.